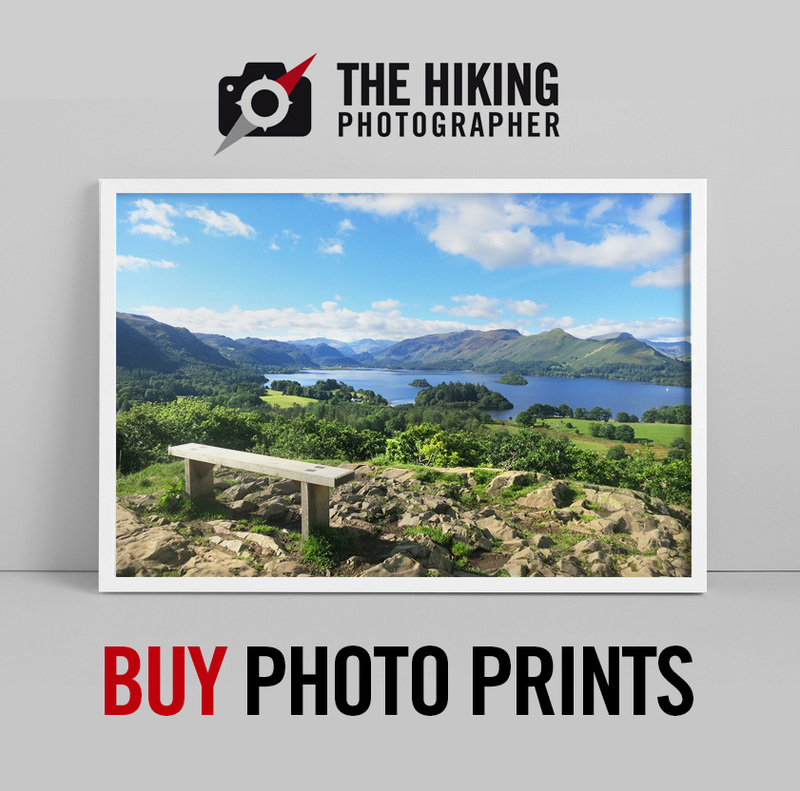 Regular readers of this blog know that it's all about hiking amongst some stunning landscapes and it's a big hobby of mine. But in my day job I'm a graphic designer, and therefore like most people these days, I spend most of my time during the week sat down at a computer - not good really! As I'm reading more and more about how this just isn't healthy for us. The Fitbit Charge 2 comes in a range of stylish interchangeable straps. To help with this goal I decided to buy a fitness tracker, and after a bit of research I opted for the Fitbit Charge 2. I'm someone who likes to monitor progress and a fitness tracker is ideal for this - as I can see how little efforts all add up through the day. Also by having it on my wrist it gives me the little nudge and constant reminder I need. I wanted something a little more than a step tracker though. I run & workout so a heart rate monitor would be useful too as I like to exercise in various heart rate zones. With a reasonable budget, but not wanting to spends hundreds, I ended up buying the Fitbit Charge 2 (How much you say? I paid £109.99 through amazon.co.uk - which was the cheapest price I found - link here) - and after a few weeks use - I'm chuffed with my purchase, I'm doing a lot more walking during the week - and my Fitbit is showing my resting heart rate is going down so I'm getting fitter! 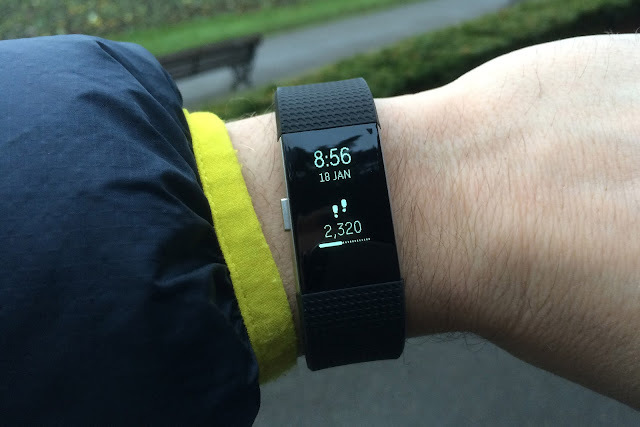 Hopefully this little post inspires you to want to walk a bit more and reap the health benefits, and if so you might be interested in my review of the Fitbit Charge 2 below. The Fitbit Charge 2 was released at the back-end of 2016 to replace the Fitbit Charge and Fitbit Charge HR. 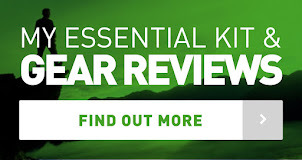 Some of the key new features include easily interchangeable straps, a larger screen display, touch-screen navigation, connection to your phones GPS, cardio fitness level rating, guided breathing sessions and reminders to move. 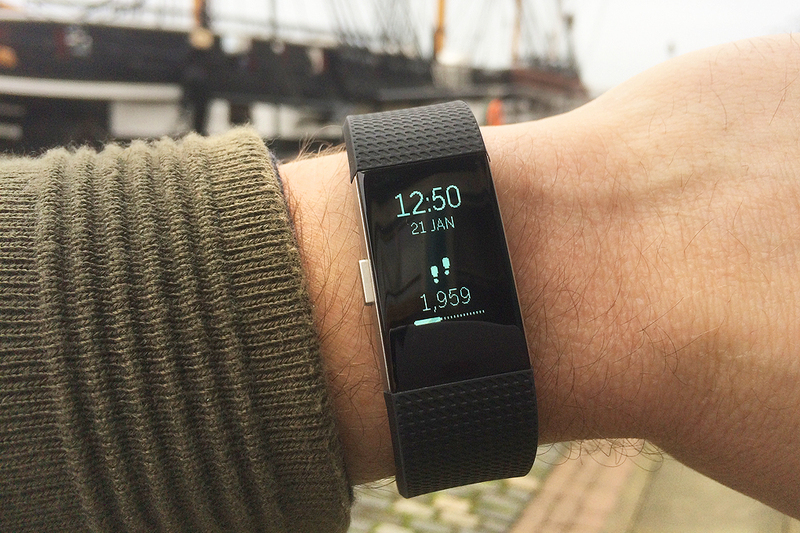 The regular display on the Fitbit Charge 2 - showing the time, date and steps so far that day. By tapping the screen with your finger or hitting the side button on the left of the Fitbit Charge - you can easily view different settings. The display is usually blank to save on battery, but by simply lifting your wrist to actually look at it - the display details appear - a pretty neat trick - and one of the reasons why a full battery charge will give you around 5 days use without charge! A big plus. 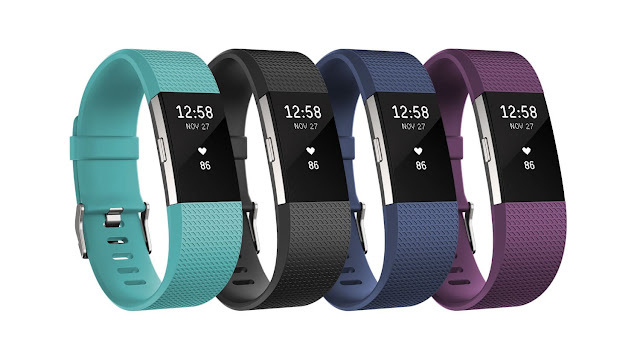 The Fitbit Charge 2 is quite slender for a HR fitness tracker and a stylish minimalist design, which looks good on your wrist weather at the gym, at work or in the pub, and you can easily change the straps to add a more personal style if you like. It’s classed as water resistant - so ok for sweaty gym sessions or if you get caught in the rain, but it’s not waterproof - so you have to take it off in the shower or for swimming. I’ve found it comfortable whether walking, running, typing at a computer or lifting weights. The OLED screen display is larger than previous models and the home screen shows time, date and steps. A simple tap on the side-button at the side or on the screen can toggle the next set of information. It’s reasonably accurate at tracking steps and it even tracks steps when you are walking with your hands stationery in your pocket or on a treadmill! I'm not sure how it does this though perhaps using movement and heart rate increase to track steps - and it’s quite accurate. To be honest I think it's difficult for any fitness tracker on your wrist to be 100% accurate, and I'm not going to lose any sleep if my registered steps are a couple of hundred out a day - the important thing for me is that it's making me just get as many steps as possible in! 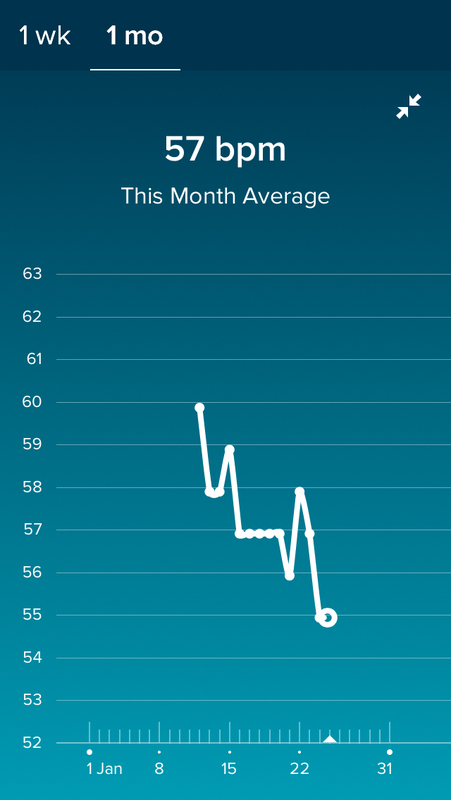 I have used my Fitbit when running to measure heart rate - and this is pretty important for me as I like to run at a steady pace in a particular heart rate zone - and is one of the key features that made me choose this fitness tracker as you can see your heart rate on your wrist at a quick glance. 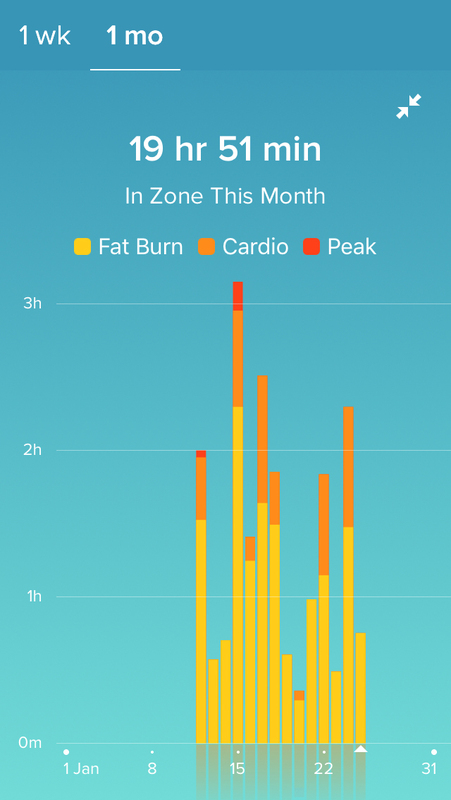 A pretty neat feature of the Fitbit Charge 2 is it can tell you if you are in a Fat Burn Zone, Cardio Zone or Peak heart-rate zone. Whilst the optical heart rate monitors on your wrist are not as accurate as the heart rate straps on your chest - I have found the heart rate reading is reasonably accurate for my uses. As well as tracking steps it does track distance, which when walking I have found accurate but when running I have found the distance recorded to be a little out. (e.g. On a 10km run confirmed with my phone GPS, the distance shown via Fitbit has been a couple of hundred meters out). For training runs this isn’t an issue for me, but more advanced runners/athletes will probably be more interested in a more expensive fitness tracker with built in GPS and other features tailored to that audience. 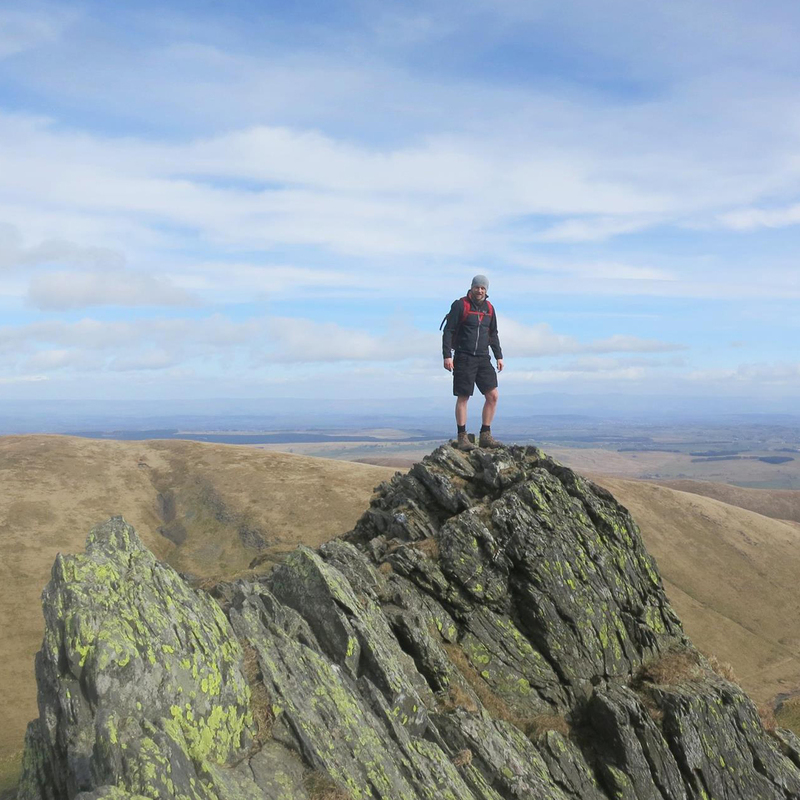 The Fitbit Charge 2 can also track steps when you are gaining height - such as floors in a building - or even a hike up a mountain like below! This feature is another little bonus, and perfect for those who want to try and relax a little. Basically you can choose either 2 minute or 5 minute guided breathing sessions. How it works is you get a little vibration on your wrist to slowly and deeply breathe in and breathe out at regular intervals and just this little prompt is enough to put your mind firmly on the breath away from distractions for that little bit of peace during your day. The fact that you can receive text messages and other social media notifications on the Fitbit Charge 2 wasn't a reason I bought it, but it’s actually come in pretty handy for text messages as it saves using your phone. I’ve found it most useful when driving actually as a quick glance at your wrist is obviously safer (and legal!) compared to looking at your phone. You can only read text messages by the way, not respond, and there is a 40 character maximum for messages, which is usually enough to get the gist of a message. I’ve yet to sync up with my social media app’s as I don’t want too may notifications though. The Fitbit Charge 2 also gives you call alerts and calendar alerts which is another useful feature. With anything digital these days, battery levels are often a pain as devices need charging constantly - but with clever battery saving and a minimalist screen display - you can get around 5 days worth of juice out of the Fitbit Charge 2 - which is pretty good as far as I’m concerned. It also gives you plenty of notice when the battery is approaching being out of charge, both on the tracker itsef and also through the battery level on the Fitbit App. In terms of how long it takes to charge the Fitbit Charge 2? 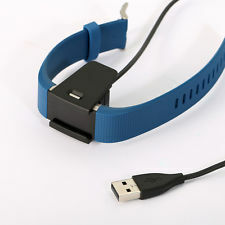 - it takes around 1-2 hours to get a full charge and this is via the USB charging lead which easily clips onto your Fitbit. The Charge 2 comes in 2 sizes - small & large. Like most watches they both have adjustable straps and I would say for most adults (men and women) a large size would be the best option - even if you have to have it on the smallest notch. 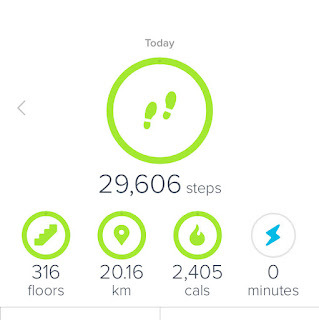 One of the great things about a Fitbit in general is the phone app that you will use alongside your fitness tracker that lets you track all your daily and historical stats and progress to help you reach your goals, keep you motivated and get fitter. 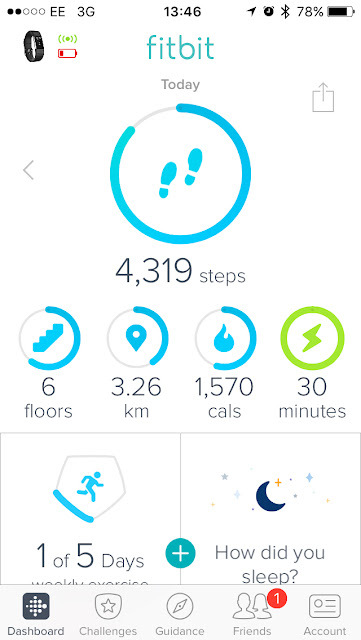 It does this with clear useful graphics and graphs to help you hit your daily goals, such as steps, floors climbed, distance, calories burned, heat rate etc etc. 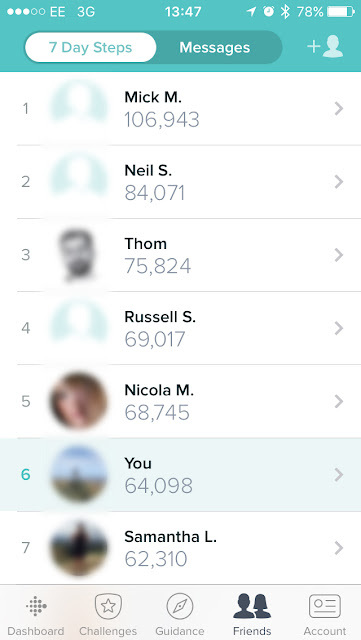 Another great thing about Fitbit in particular is the social interaction side of it, because if you have friends also using a Fitbit - you can set up challenges between each other to add that fun competitive edge to things that will make you do that little bit more. See below for some screen shots from the app to see how it looks. Well I’ll start by saying I’m more than happy with my purchase and I think it’s money well spent. I’ve never been a big watch wearer, but I’m quite used to wearing the Fitbit Charge 2 on my wrist daily now and I like the fact I have a constant reminder on my wrist to get those steps in and track my health progress. 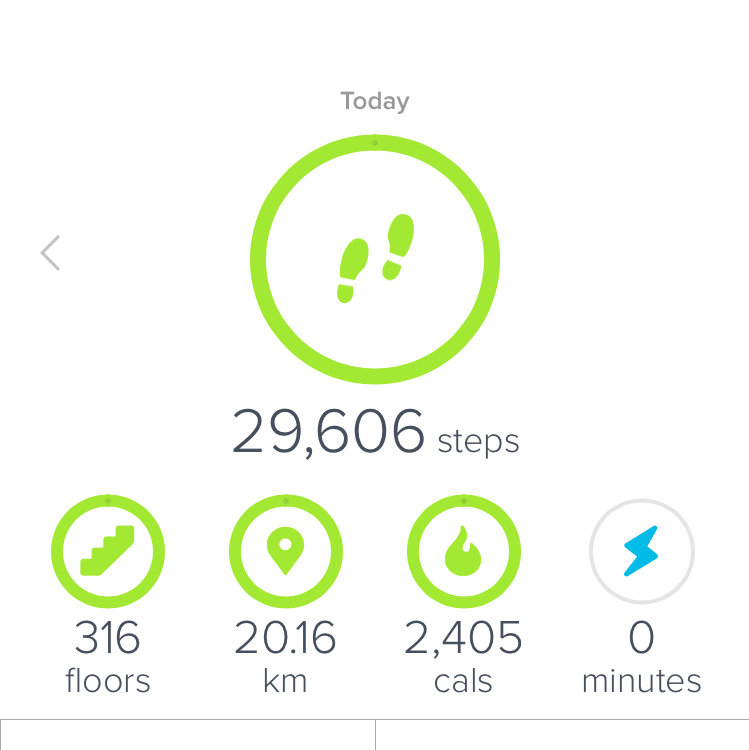 You could get a cheaper step tracker, but I think its worth paying that little bit more to have more features, such as the Heart Rate Monitor built in, especially if you like to keep fit in other ways such as going to the gym or running. More serious fitness freaks will probably want more features in this respect such as built-in GPS, but will need to pay over £200 for this. 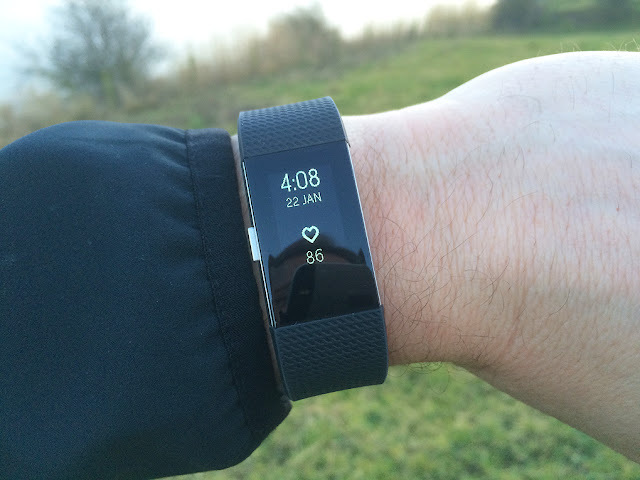 So all in all, for a regular person who just wants to get a little fitter, then I can recommend the Fitbit Charge 2 and I can see why it’s often rated the most popular mainstream fitness tracker. If you are interested in buying one - then the cheapest I found it was on amazon priced at £109.99, it seems in most places it's priced at £119.99. 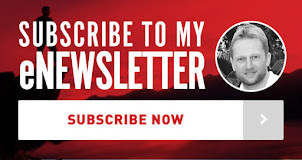 If you enjoyed this blog post you might like to check out my other blog posts on this site or subscribe to my email newsletter to stay up to date with my latest posts, just follow the link below, cheers Stuart.